Janet L. Yellen, the Fed chair, introduced the topic of hysteresis in an October 14 speech. 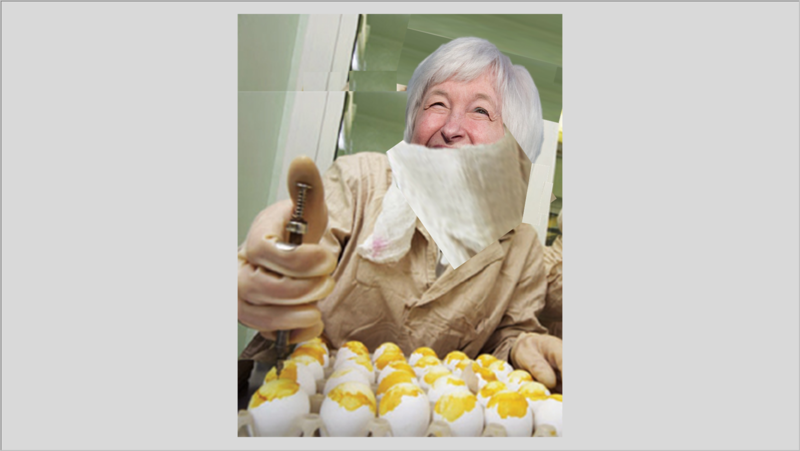 To inoculate the markets worldwide as well as her fellow members of the Fed Board of Governors against the possibility that the U.S. central bank will run a "high-pressure" economy and maintain low rates for longer than expected, she announced her intention to try to cure hysteresis. If the expected hike by the Fed does indeed occur in December, Dr. Yellen may be throwing a bone to Federal Open Market Committee inflation hawks and putting the FOMC as well as the rest of the world on notice not to expect another rate hike until hysteresis is cured or on the mend. Yellen is betting that easy Fed monetary policy can lure back into the labor force the growing segment of the U.S. population who are over 65 and might like a job if one becomes available as wages continue to improve. The labor force participation rate was announced on Friday and, at 62.8%, it has been stuck for about three years. The Federal Reserve Board probably won’t be satisfied unless it brings the labor participation rate up to at least 64%, and that small adjustment is likely to make an expected December 2016 rate hike the last one for at least a few months. 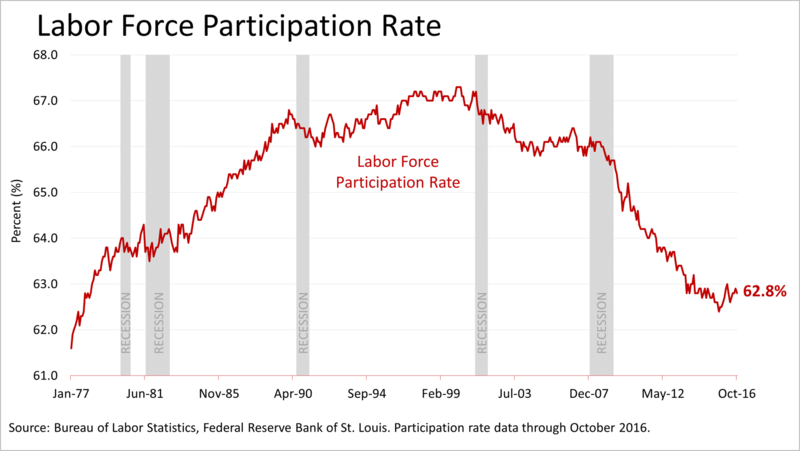 Since peaking in 1999 at 67.3%, the labor participation rate has dropped, precipitously since the economic turnaround began in 2009. The extent of the damage to the economy in The Great Recession has undoubtedly extended the length of time it has taken for the labor participation rate to top the rate achieved in the last economic boom. But the age of the labor force — a structural factor, an artifact of demographics — is limiting the growth of the labor force. Economists call this problem plaguing the labor force participation rate hysteresis, which sounds really bad. But it’s not so bad a condition. The stock market, as measured by the Standard & Poor’s 500 stock index, dropped for the ninth straight day on Friday, which the Associated Press reports is the longest losing period in more three decades, but that it’s a cumulative decline of just 3.1%. U.S. employers added a solid 161,000 jobs in October and average hourly earnings rose sharply. Many major news outlets attributed the jitters to the closeness of the Presidential race and uncertainty over the future of the majority in Congress. The S&P 500 closed Friday at 2085.18, down fractionally despite the continued good economic news. 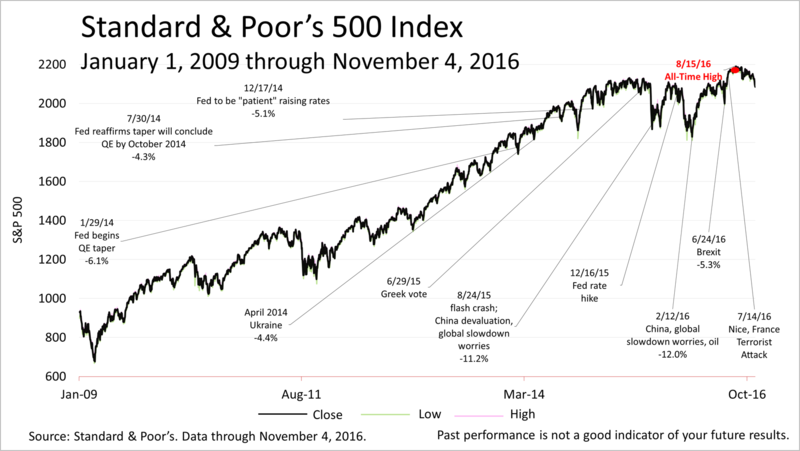 Stock prices are still near an all-time high, and an unexpected event, like the election of Donald Trump, could cause a pullback and change in sentiment of market participants, despite all the positive news and strong overall condition of the economy. Past performance does not guarantee future returns, especially over short periods, which is why this chart shows you how far stocks have come since the U.S. economy emerged from The Great Recession. This article was compiled by Fritz Meyer, an independent economist, in collaboration with a veteran financial journalist. While these are sources we believe to be reliable, the information is not intended to be used by as financial advice without consulting a professional about your personal situation. Indices are unmanaged and not available for direct investment. Investments with higher return potential carry greater risk for loss. 1Labor force participation rate: the proportion of the civilian noninstitutional population 16 years of age and older either at work or actively seeking work. (247.4 million).